A comprehensive accounts payable management certification program. Why get an Accounts Payable Management Certification? Improve your credibility. 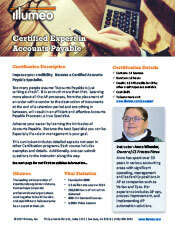 Become a Certified Accounts Payable Manager. How confident are you that you have been exposed to all facets of Accounts Payable? There is a chance your current role, or even your company, doesn’t apply all AP processes so consider certification to confirm or advance your knowledge base and skill set. Advance your career by learning the intricacies of Accounts Payable; how to manage people, processes and projects. Become the best AP Manager you can be. This curriculum includes detailed aspects not seen in other certification programs. Each course includes examples and details. Additionally, one can submit questions to the instructor along the way. Once you complete this Accounts Payable Management certification, have a copy of your certificate added to your HR file and update your resume. You are ready for future AP challenges. Anne Wheeler started CS Process Flows, LLC inn 2016 after more than 30 years working in accounts payable. Initially hired as a processor, Ms.Wheeler has worked in accounts receivable and general accounting before returning to her true passion: accounts payable and all of the exciting challenges happening in the field. Her experience includes building new AP operations, identifying inefficiencies and implementing solutions in existing teams and being involved with other areas of the Procure to Pay work stream. Having managed up to 25 AP staff members processing upwards of 30,000 invoices per month, she is a genuine expert and skilled accounts payable professional. This course offers details on critical AP terminology and examples of how and when the terms may be used. This course reviews the definition of liabilities as it pertains to Accounts Payable before exploring the different responsibilities of AP operations. This course covers the forms to be obtained from each potential Vendor before setting up a record in the system. This course covers the basics of 1099's like identifying the Vendors that should receive a 1099 and how to determine the amounts to be reported. This course explores how to divide your AP work into smaller piles allowing for prioritization and motivation. This course explains the detailed steps that can be taken by Accounts Payable to strengthen vendor relationships. This course is for people who work with Purchase Orders when ordering product or services. This course covers the methods for determining what needs to be audited. This course explores the benefits of an Accounts Payable Recovery Audit. This course explains what “No PO, No Pay” means and why companies are moving to this model. The course explores the differences between Accounts Payable Workflow and a Document Management system. This course identifies the steps to take when creating an Accounts Payable Documentation Policy and discover the points that should be included. This course presents various AP topics and offers examples of communications. This course provides tips and tricks you can use to get what you need in Accounts Payable Operations. This course teaches the importance of having AP play a leading role on any project team implementing a project or system that impacts AP. In this course you'll explore how to calculate and use a number of key AP KPIs.